Easy Way to Backup & Restore LENOVO K4 NOTE / VIBE X3 LITE (A7010/A48) Contact, SMS, Data, Picture Before Doing Hard Reset Format? Tips for backup all important data at LENOVO K4 NOTE / VIBE X3 LITE (A7010/A48) including contact, text messaging, photo, video, downloaded files and some other data. Using 5.5 inches LCD screen smartphone to work everyday will make this phone have several important files. The camera also working good with 13 megapixel main camera resolutions and 5 megapixel front camera resolutions will make this phone have some important pictures, www.hard-reset.org give important steps to backup & restore. We need to backup all data and photos before something happen at our LENOVO K4 NOTE / VIBE X3 LITE (A7010/A48) like broken or corrupt or phone lost / stolen. Almost all of us will have many contact or phonebook data at LENOVO K4 NOTE / VIBE X3 LITE which are very important. We have to backup all important data at safety location. One important thing when we use Android is synchronization, we can synchronize our contact data to Google account at Google server, what we have to do is make sure our phone already sign in with our personal Google account. After doing login, the phone by default will automatically synchronize or backup our data to Google cloud server, so we will have 2 phonebook storage, one is at our LENOVO K4 NOTE / VIBE X3 LITE and the other one at https://contacts.google.com. Please check that address to make sure all data already backup at Google server. How to Backup Phone Book or Contact at LENOVO K4 NOTE / VIBE X3 LITE (A7010/A48) Manually to SDCard Memory? Beside having backup at Google could for our contact, we can also backup or export our contact or phonebook at LENOVO K4 NOTE / VIBE X3 LITE using Export menu at Contacts menu. 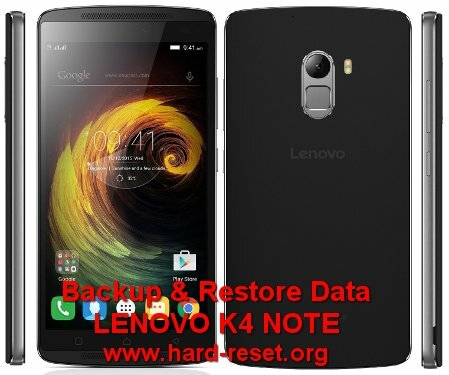 How to Backup Picture/Photo LENOVO K4 NOTE / VIBE X3 LITE (A7010/A48) ? Photo also important to backup because with good camera quality at LENOVO K4 NOTE / VIBE X3 LITE, we will have many important pictures for special moment. There are several options to backup our media like Photo and Pictures to several location, the easier step is backup our media to external microSD memory card. But for this step we need to prepare our MicroSD card first and insert it into memory card slot at our LENOVO K4 NOTE / VIBE X3 LITE. [A] Hi, please try to use computer Internet browser, and login to https://www.google.com/contacts. If your phone previously do automatic cloud backup to Google account, then you can find that contact at Google server, but please note you have to know the Google account at your previous phone first, then use that Google account to login at computer browser. [Q] maine lenovo k 4 note ko format kiya hai format karne ke baad new google account ko add kaise kiya jayega iska details dijiye. [A] Hi, sorry reply in English. The firmware upgrade at Lenovo K4 usually will not make any troubles with already sign-in Google account. However, you may try to check if that account ask for password, please type with known password for that account. Otherwise you have to do hard reset to master format your Lenovo K4 operating system to factory default, so all account and installed apps will be new again for new firmware / OS version. maine lenovo k 4 note ko format kiya hai format karne ke baad new google account ko add kaise kiya jayega iska details dijiye. Hi, sorry reply in English. The firmware upgrade at Lenovo K4 usually will not make any troubles with already sign-in Google account. However, you may try to check if that account ask for password, please type with known password for that account. Otherwise you have to do hard reset to master format your Lenovo K4 operating system to factory default, so all account and installed apps will be new again for new firmware / OS version. Hi, please try to use computer Internet browser, and login to https://www.google.com/contacts. If your phone previously do automatic cloud backup to Google account, then you can find that contact at Google server, but please note you have to know the Google account at your previous phone first, then use that Google account to login at computer browser.